Austin-based Miró Rivera Architects are the designers of the signature buildings at the Circuit of The Americas, the first purpose-built Formula 1 Grand Prix™ facility in the United States. The architectural features of this new world-class motorsports and entertainment venue include the Grand Plaza, the 6,500-seat Tower Amphitheater, the Main Grandstand, a 251-foot tall Observation Tower, ticketing buildings, concession areas and two bridges over the track. As the designers of the main public spaces and buildings around the 3.4-mile track, Miró Rivera Architects are responsible for the aesthetic and much of the experiential qualities of the site. 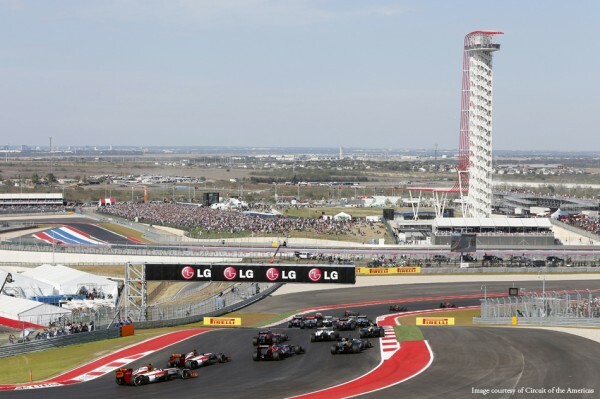 Circuit of The Americas hosted its first major event, the 2012 Formula 1 United States Grand Prix, November 16-18, 2012. The main architectural language of the facility evokes the precision, dynamism and performance-driven design of racecars. It is also visually stimulating, incorporating banners, billboards and bold graphics. The architects bring their innovative approach to the structural systems: rather than being concealed behind a building’s façade they are articulated and become significant parts of the design. An architectural theme reoccurring throughout the site is the use of red steel tubes. The tubes cascade down the side of the Observation Tower to form a canopy for the Amphitheater stage and also frame the Main Grandstand. Evocative of sports cars and movement, this element ties the structures together creating a consistent visual experience. The Observation Tower serves as the centerpiece of the complex, which rises over the racetrack offering sweeping views of the entire venue, downtown Austin and the nearby Hill Country. The tower, a dramatic backdrop to the Amphitheater, provides a visual end to the Grand Plaza and also serves as a reference point for spectators throughout the site. Its observation platform at the top can hold up to 75 people and features glass railings and a glass floor. 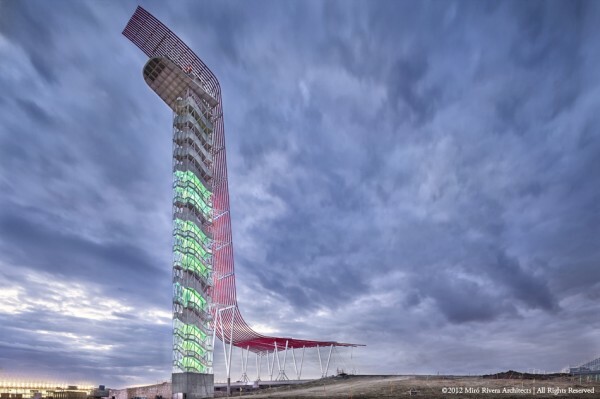 Inspired by the image of red streaks of glowing light that racecar tails leave behind in the dark, the Tower is built from steel and is composed of a white shaft with two sets of stairs wrapping around a high-speed elevator and a red “veil” formed pipes measuring eight inches in diameter. The “veil” flows down from the observation platform and fans out at the tower’s base to form a large drop-off area and the roof of the Amphitheater stage. As seen from the bottom, the red pipes spread out at the base of the tower coming together as they move up, culminating at the top of the vertical column and pointing out towards the track. The Tower design freezes that moment into an iconic form, evocative of the movement and energy associated with the Circuit of The Americas. The Main Grandstand is located in front of the start and finish lines with views of Turn 1 and provides seating to over 9,000 spectators on three levels. The ground level houses offices and concessions, while the second floor contains amenities, including a 6,500 square-foot lounge and event space. The third floor hosts a second lounge and 29 private suites. The Main Grandstand and the concessions buildings in the Grand Plaza were conceived as a modular system consisting of several components that can be arranged according to need. The concessions, with banners and deep canopies, can be expanded with restrooms, permanent seating or suites. Inherent to this “kit-of-parts” construction system is flexibility allowing the site to grow and change.